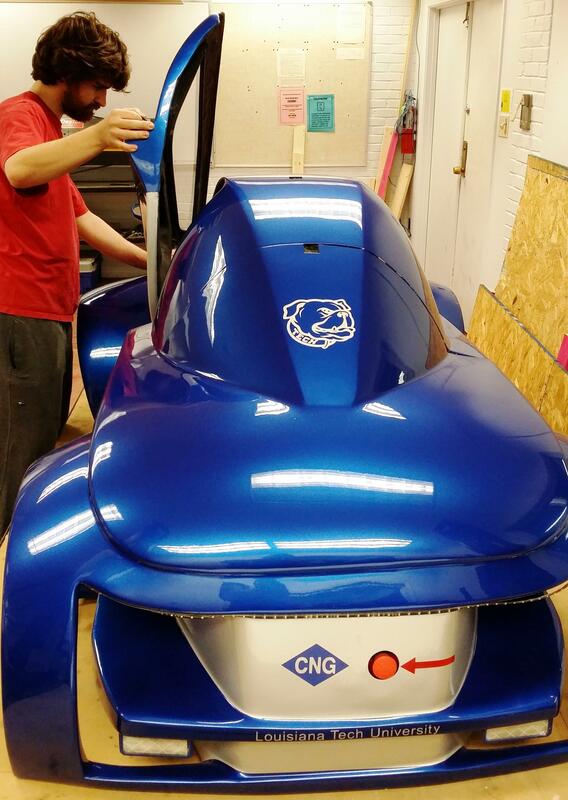 More than a dozen engineering students from Louisiana Tech University in Ruston have built two vehicles to compete in this year’s Shell Eco-marathon Americas competition in Detroit next week. One vehicle is a diesel. The other runs on compressed natural gas. Louisiana Tech mechanical engineering junior Timothy Parker of Mandeville, La., helps to put the finishing touches on a compressed natural gas vehicle that will compete in the urban concept category. Michael Swanbom, a senior lecturer of mechanical engineering, is advising the students in the eighth year Louisiana Tech has entered this global competition for ultra-high energy vehicles. Swanbom says Tech’s entries are getting their bodywork done now. “We call it the character building phase at the point when a lot of the body work is being done on these vehicles. Our team wants to make really good looking vehicles. That takes a lot of elbow grease to make them look that way,” Swanbom said. Swanbom predicts the diesel vehicle could break a Louisiana Tech record and exceed 500 miles per gallon. Timothy Parker, a junior mechanical engineering major and a team lead, says he volunteers more than 40 hours a week on this project. “It’s a lot of fun and I like getting my hands on things and really getting to work with the concepts I learn in class, and apply them in a way that I can actually see the fruits of my labor, so to speak,” Parker said, who started working on Tech’s entries his freshman year and hopes to one day be an engine researcher for an automobile maker. More than 1,200 high school and university students from across the Americas will compete in Detroit. Swanbom says this is a one-of-a-kind learning experience and it’s become a centerpiece of Louisiana Tech’s engineering program. 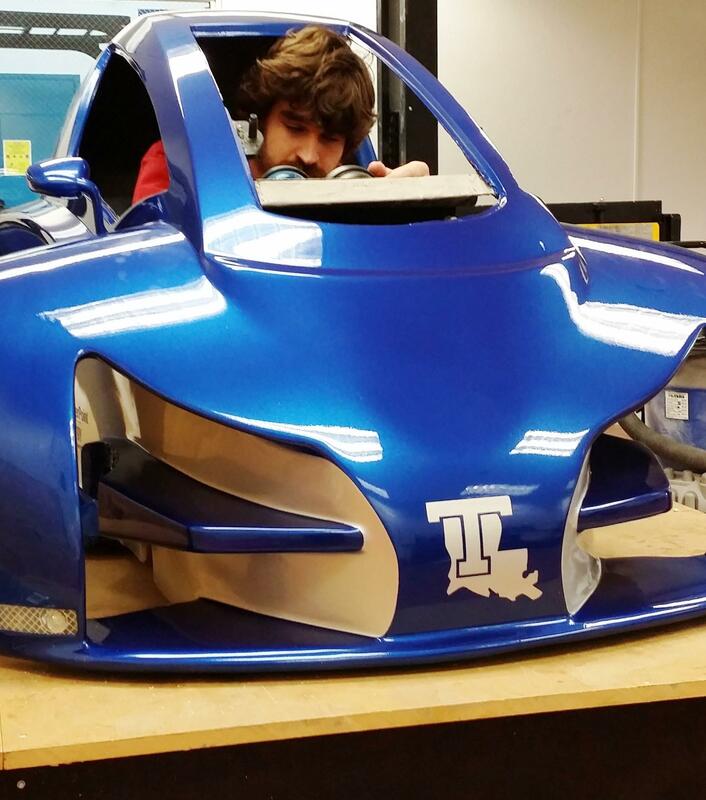 Louisiana Tech's urban concept vehicles top out at 300 pounds. Mechanical engineering student Timothy Parker works inside Louisiana Tech's compressed natural vehicle entry. “We’re trying to get students to really have a feel for what it means to save energy with respect to transportation. That’s an experience that would be really hard or impossible to get any other way in an educational setting,” Swanbom said. Last year, Tech’s team received the fuel-efficiency award for a diesel. Ruston High School is entering its fourth year of competition and the two teams will caravan to Detroit with their vehicles on Tuesday, April 19. The Shell Eco-marathon Americas is set for April 22 – 24 in downtown Detroit in the 10th year of competition. Louisiana Tech University engineering students built a diesel vehicle that got 338 miles per gallon on the streets of Detroit this month. The students built a futuristic vehicle that competed in this year’s Shell Eco-marathon Americas. Louisiana Tech placed second in the UrbanConcept diesel category. Tech has competed for the past seven years and currently holds the record for fuel efficiency in this category. Mechanical engineering professor Heath Tims is the faculty adviser for the eco-marathon.